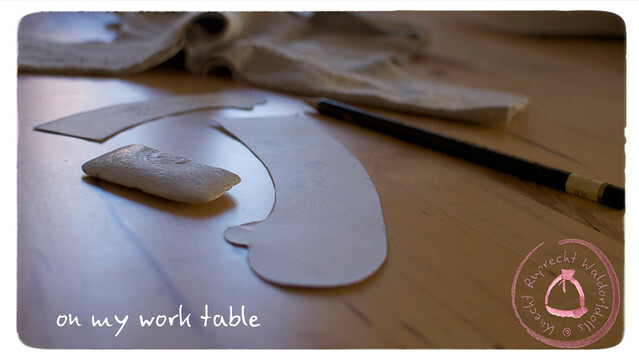 I grew up in a family of artists, with lots of self-made and handcrafted goods around myself. During my time as a Waldorf student I was educated in all different kinds of arts and craftsmanship. After having finished my studies in Visual Fine Arts at the University of Art and Industrial Design in Linz I started working as an independent artist in the fields of media art, installation art, film and photography and exhibited my work at a number of national and international institutions. Since I am a mother to a little daughter and a little son I started working on dolls and wooden toys for my children like my mother did for me when I was little. Some friends asked if I could create dolls and wooden toys for their children too and so I started to sell my handcrafted treasures for babies and children. 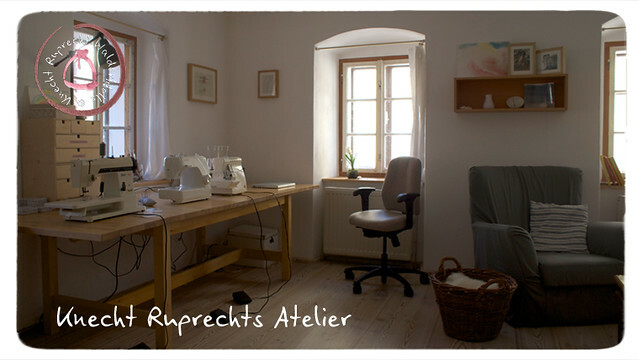 I live and work together with my family in the north of Austria's countryside. My first sale on etsy was ordered from Texas which was quite exotic for me living in Austria. 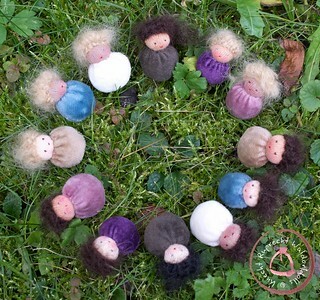 I was so thrilled and loved the idea to send my dolls to children all over the world. My dream came true and now there are Knecht Ruprecht Dolls all over the world. I am so pleased and happy to make these dolls and last but not least this kind of work is very compatibly while having little children. It allows me to stay at home with them and work beside them when they play, having my sewing basket at my side. What makes Waldorf dolls so different from mainstream dolls? The Waldorf Doll has been used in Waldorf education for generations. 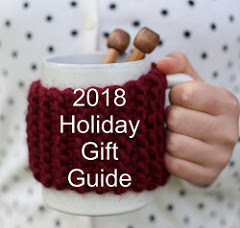 It is handcrafted with loving care using only natural materials like pure lambs wool and cotton, materials that are soft and warm to the touch. When cuddled, a wool stuffed doll takes on the warmth of the child, a warmth that makes the doll come alive. The origins of this type of doll come from a strong European tradition of doll making. Many dolls were made by mamas at home during long winter months from materials that were at hand, like sheep's wool and cloth scraps, instantly giving life to those simple materials. The appearance of a Waldorf Doll is intentionally simple with minimal facial features in order to allow the child playing with it to improve and strengthen imagination and creativity. The beauty of simplicity is stimulating creative learning by drawing on the child’s imagination. At first glance, it may occur not to be so much effort to create such a simple doll, with few facial features instead of a more detailed doll. But actually, it is a great challenge to put life into a doll's face using only a few stitches. Hand embroidering a dolls face is always something special for me. I do have to center myself to find calmness and serenity for that task. 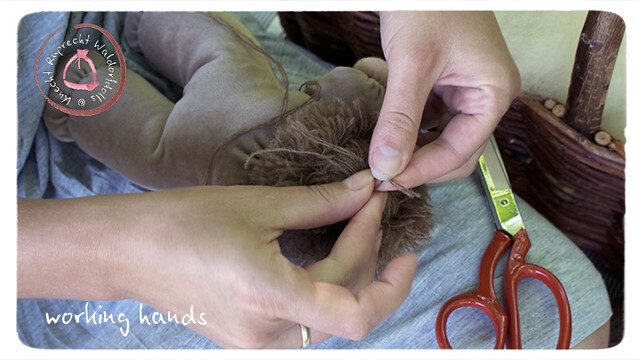 Every stitch has to be in the perfect spot in order to make a dolls face shine. In my opinion the main effort about Waldorf doll or Waldorf toy making in general, is to find what is essential, to limit it to that and to put soul into the creation. Play is the true work of our children, therefore whenever possible we should provide them with the best and highest quality play things. 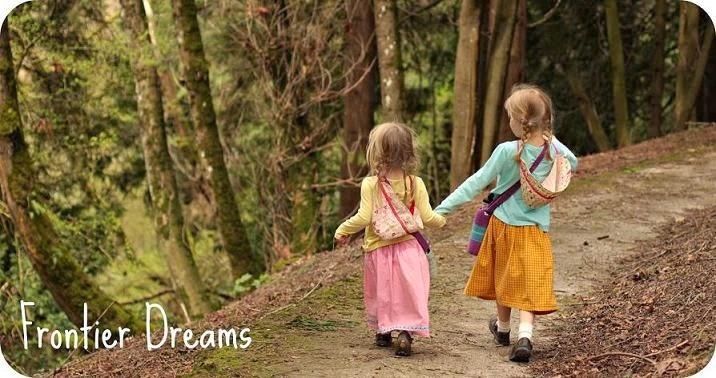 Surrounding our children with handmade and natural toys means that their memories will be full of these natural, important, and handmade things, rather than toys that are unimportant, inexpensive and disposable. Thanks, Marie! If you would like to learn more about Marie, you can find her at her blog, on flickr and pinterest and of course at her shop located here and here. Today Marie is offering one of her wee Waldorf walnut babies to one of you lucky readers. A Walnut Baby is a beautiful ornament for a newborn. It can be used as a dollhouse families baby and it is a beautiful decoration on the nature table. 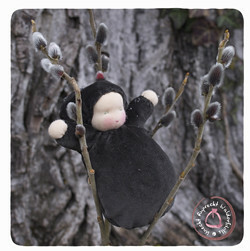 The baby is handmade from the best doll making materials and bedded on organic lambs wool in an organic grown walnut shell. It is the limited edition of twelve babies this year. The shell comes from our very old Austrian "Klosternuß" walnut tree. 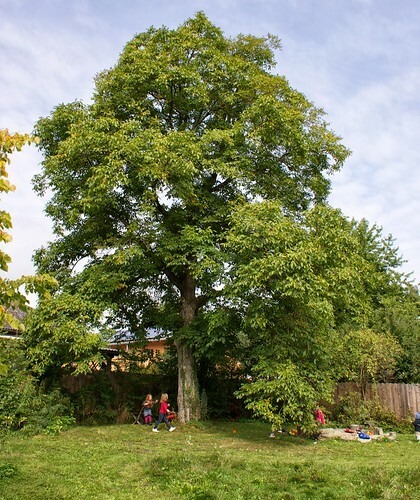 This kind of walnut tree is rare to find and known for its large and beautiful shells. The Walnut shells are about 5 cm. I have to add that my girls have one of Marie's walnut babies and treasure it. That little baby gets carried everywhere! It's the perfect size. and please make sure to come back and leave me another comment letting me know you did so! I will close comments on Wednesday October 30th and announce the winner within this post. My grandmother used to make me toys out of walnuts and chestnuts. I used to love this. I imagine she played with the same kind of toys as a child growing up during WWII in Germany with little money to spare for frivolities. 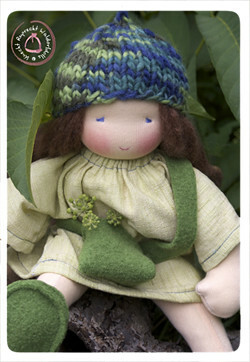 Nonetheless, these are very sweet dolls and would love to win this to share with my children.